I am SO excited to share this with you! Some of you have been traveling alongside me since the very start of this journey. And NOW, she is here! Yeeha! 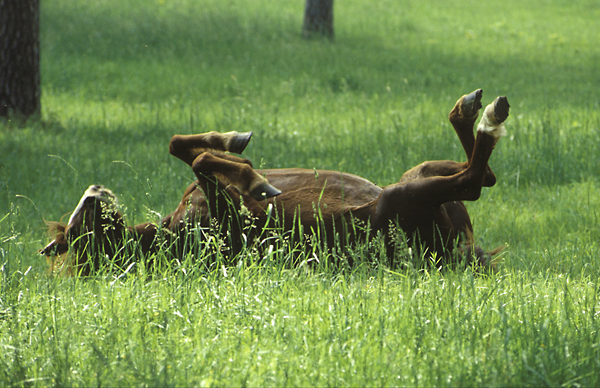 I’m about as happy as this horse in the grass! The books are here, my friends – and they are gorgeous! VERY soon now – the brand new website will be up and running and I will be able to offer these to you! Thanks for traveling all these miles with me – I can’t wait for you to have these! Louie, my big, loving, serene (I would never say “lazy” cat), who spends most of his days in the office with me, got a little nervous one day last week. I didn’t quite set off fireworks, but I did get up from the computer and do a little happy dance, which he found quite unseemly! Roadtrip with a Raindrop is on its way to the printers!! It was, without a doubt, the biggest, most complex project I have ever undertaken – AND it will be worth every bit of what it took to bring it to this point! The book will be 10″ tall x 9″ wide, 240 pages with nearly 200 full-color photographs. I shared the cover in the last post – and thank you for all your wonderful responses! The interior design is clean and inviting and is perfect, I think, for both the photographs and the stories. Every detail is the best possible quality – there is even a satin ribbon placeholder. I cannot wait to share it with you! Bob Krist is an internationally-acclaimed photographer for National Geographic Traveler, National Geographic and Smithsonian. He has won “Travel Photographer of the Year” three times. I have admired him and his work for more than two decades. Back in 2002, I was lucky to be in a workshop with him at the Maine Photographic Workshops and it was life-changing. He encouraged me to find time for a personal project that really moved me. That is what opened my heart for this Mississippi River adventure. “As literature and myth illustrate time and time again, a river journey can be a life-altering experience. Whether it’s the young Buddha in Siddhartha, Mr. Kurtz in Heart of Darkness, or Huck in The Adventures of Huckleberry Finn, an epic river voyage teaches the traveler as much or more about himself than about the topography and geography of the waterway itself. It’s an exterior trip that prompts an interior journey. 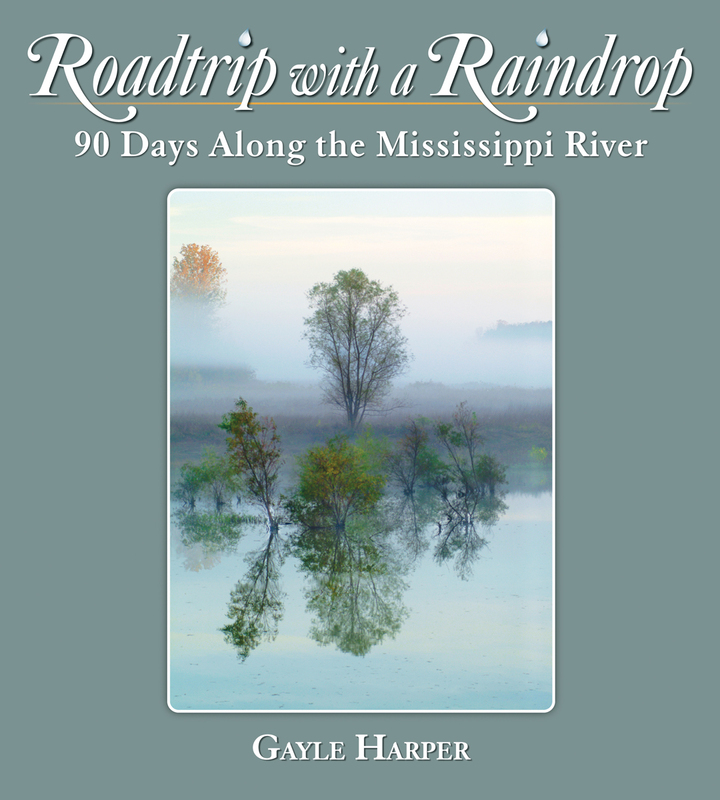 Fortunately for us, Gayle Harper’s book, Roadtrip with a Raindrop, is both. 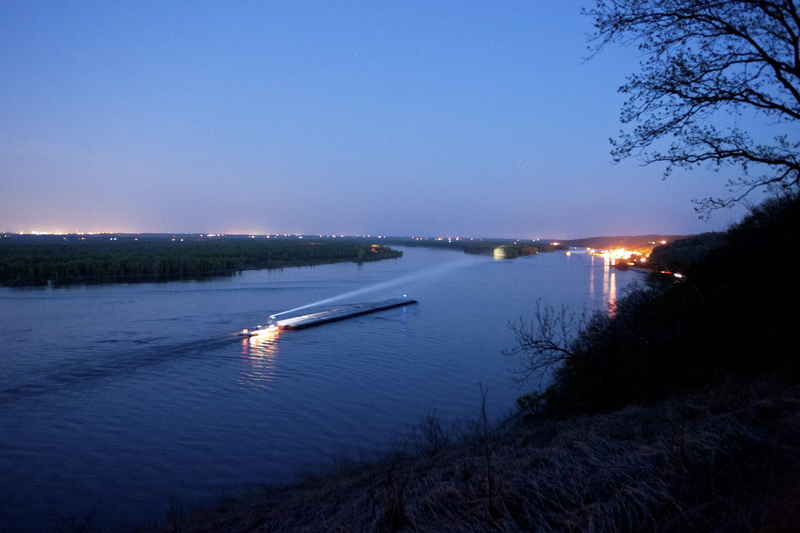 While her encounters with the beauty of the Mississippi and the wide array of humanity who make their home along the river — barge captains, blues musicians, artists, hunters, historical reenactors and even a jolly nun — obviously move her in a profound way, she never fails to take us along to share her experience. Like Vasudeva, the ferryman who helps Siddhartha find enlightenment in the rhythms of the mythic river, Harper acts as our ferryman, documenting the beauty of this mother of all North American rivers and its people in stunning photography and rich prose, while she herself undergoes the profound changes that occur when an artist meets her project of a lifetime. 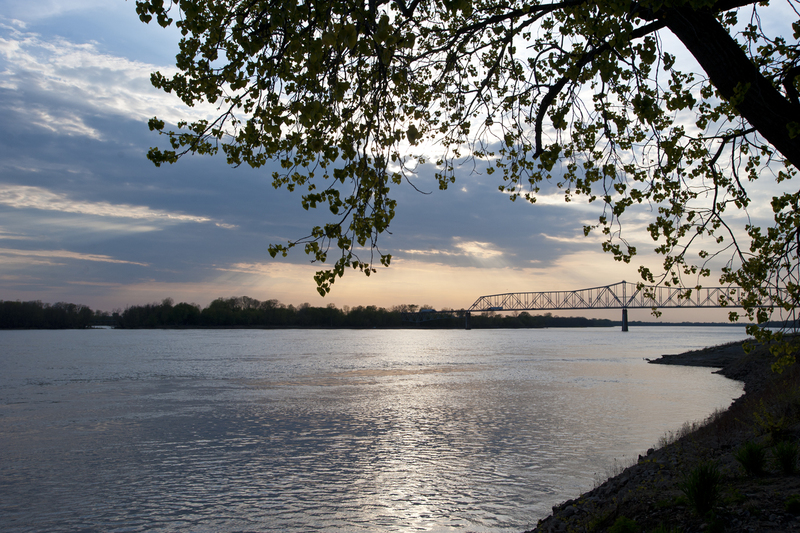 The result is a beautiful, warm and intimate portrait, as stunning to look at as it is to read, that makes us appreciate all that the Mississippi River has meant and continues to mean to America. In these pages, we feel the river’s pulse, we come to know and appreciate its people, and in doing so, we learn more about ourselves. So, with a heart overflowing with gratitude for this entire, incredible adventure, Roadtrip with a Raindrop was kissed, bundled up and sent off to the printers. We expect to have books by Thanksgiving. I will be back in touch before long with details about when and how it will be available. For now, thank you for being part of this amazing journey! 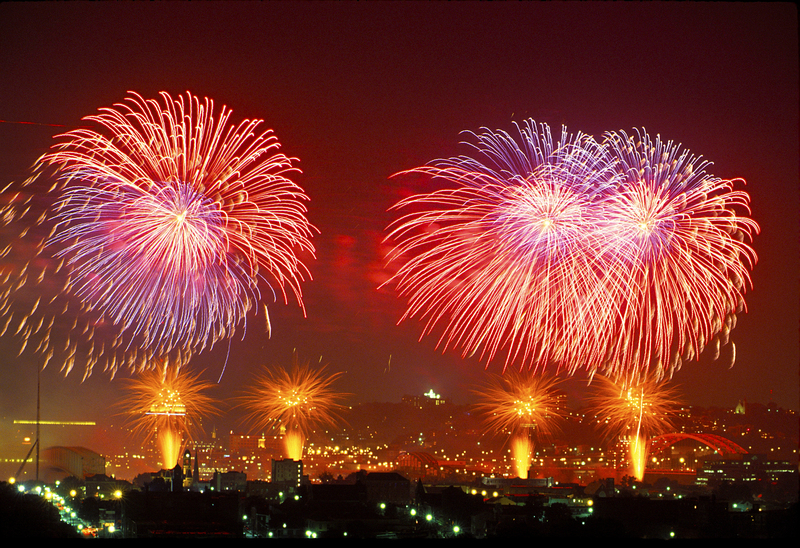 It’s been a bit of a quiet spell on this blog, but, believe me, there is LOTS going on! It’s a BIG day for our little raindrop today. The cover of Roadtrip with a Raindrop is being revealed! Here it is – I hope you like it! And I would love to hear your comments! The book will be 10″ tall x 9″ wide – and, if all continues to go well, we should have them in hand before Thanksgiving! Thanks, once again, for traveling with us! I truly appreciate you! I’ve missed you! Things in Serendipity-land have been fun and exciting, although sometimes keeping up with it feels a bit like trying to drink from a fire hose! It is time, however, to stop and catch up with my friends! First, the book is coming along wonderfully! The copyedit is finished and we are moving into layout and design, choosing a photo for the cover and diving into a thousand other decisions and details. I’m SO thankful for the amazing team of experts working on this. We expect to have books in your hands by the fall! After a meeting with the publisher, the editor, the designer and the marketing expert, I saw an opportunity to get a little “river fix” and I took it! 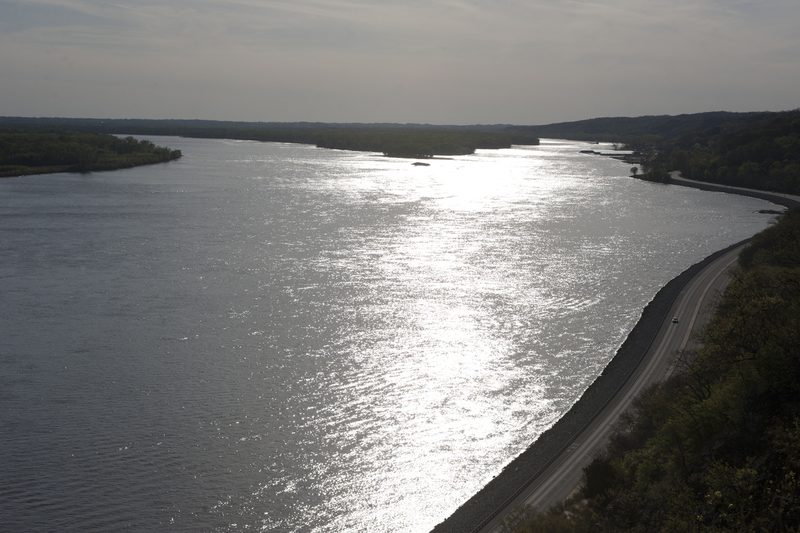 I beat it over to a lovely piece of the Illinois Great River Road and, as I love to do, just let go of the reins. 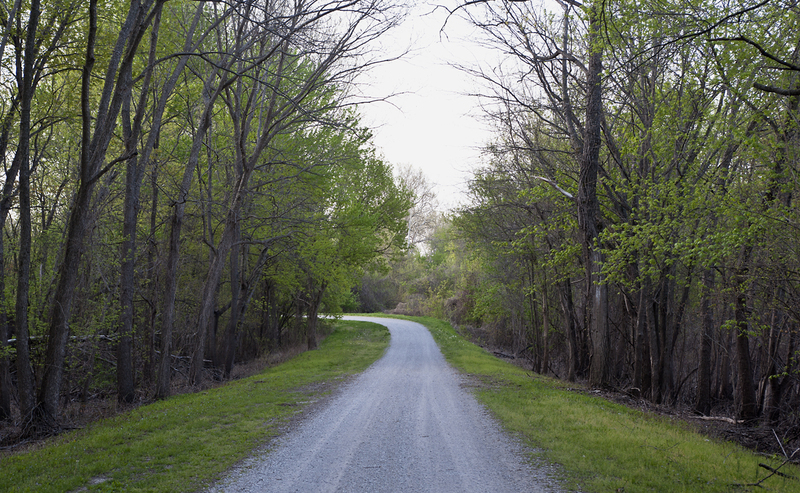 Wandering along back roads in unknown territory felt like a homecoming of the most heart-swelling kind! it didn’t matter where I went or what I saw or whether I got any photographs, I was just being there, drinking it all in. 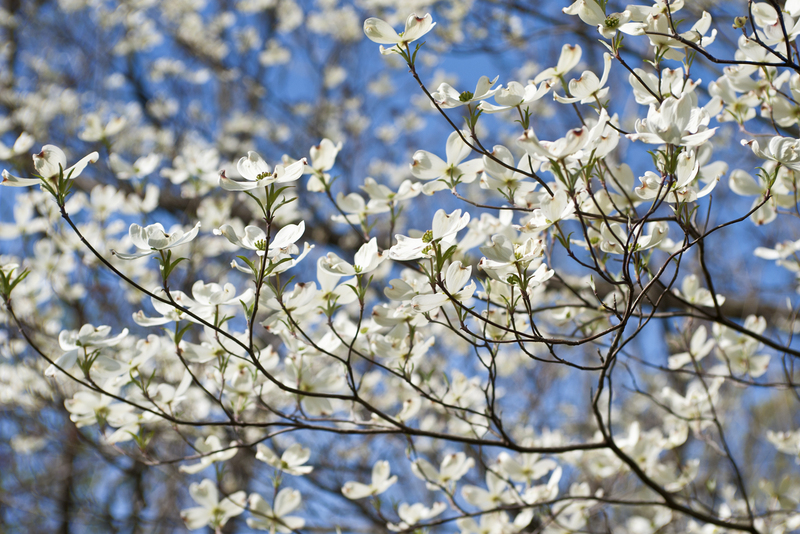 The dogwoods were in bloom and the grass and trees were wide awake and fully alive with that brand-new, impossibly green, color that can never be reproduced. When I rounded a bend and the river burst into full view, it felt like finally laying eyes on a loved one in a crowd at the airport. I sighed, rested, breathed deeply and felt realigned and reconnected. and again before sunrise, when a passing barge made the scene even more interesting. Then I made fast tracks back home, did my laundry, repacked and headed west to Denver for a two-day conference – the “Author U Extravaganza.” I learned so much that I thought my head might explode. Being with so many talented, creative people and learning about all their unique projects was such a high that it was nearly impossible to shut my mind down at night. And, having so many seasoned experts in the world of book publishing respond to Surrendering to Serendipity with excitement and offers to help, made my heart feel like it might burst. I left tired, but filled to the brim. So, I’ve recharged my soul with a river fix, stuffed my mind and my heart and had some perfectly wonderful family time as well – and I’m rarin’ to go again! Lead on, Serendipity! P.S. 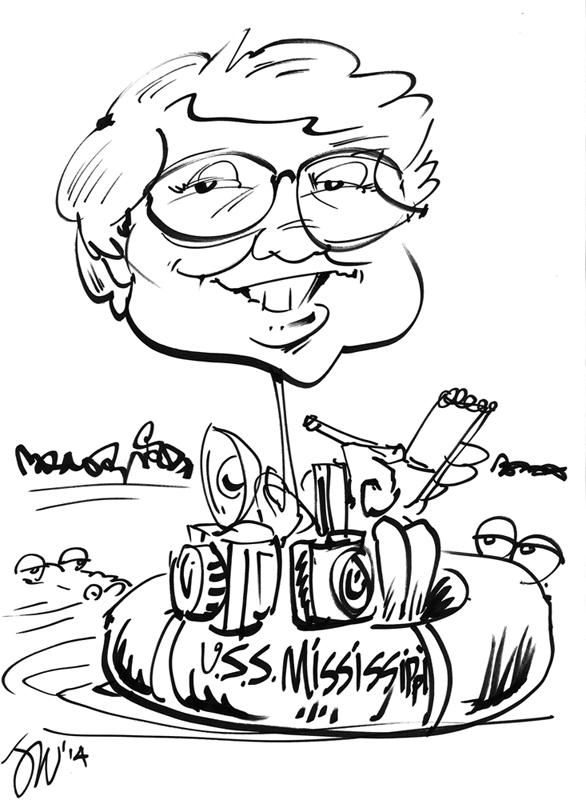 – I also came away from the conference with this…a caricature done by Jake Williams, a fun, talented and very nice guy! Whatcha think? Like most of us, I’ve been keeping to a pretty intense schedule of work for what seems a long time now. For the past several days, I’ve been waking up at my usual 5:00 am and then, without actually deciding to do so, going back to sleep and having some very colorful, interesting dreams. My husband, Mike, and I and another friend were going to the Circus. At the door, I realized I didn’t have my ticket – that it was at home in another purse. After a little discussion, we decided I shouldn’t waste the $40 ticket (expensive circus!) – that I would go home and get it and come in late. I left feeling pretty disgruntled with myself! I couldn’t remember where we parked the car and wandered around, getting increasingly frustrated and irritated with myself. Then, it was suddenly all OK because I had a bowl of magic curried sweet potatoes and if I held it out in front of me, I could float above the ground and it was great fun. I got lost looking for the car, but I was having a great time flying with my sweet potatoes! Now, I’ve no doubt that someone well-versed in dream interpretation might find something symbolic in all that, but to me, the message is quite clear. There is wonder, magic and fun in every moment – don’t miss out on it by taking myself, my work, my life or my mistakes too seriously! 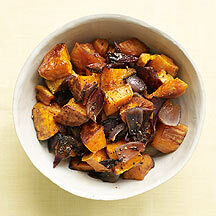 AND – although she can’t guarantee their flying ability, a friend just sent me her recipe for Curried Sweet Potatoes! I’ve had them and they are delicious – even with both feet on the ground! Wanna give them a go? Here tis! Preheat oven to 375. In small bowl, mix salt, pepper and curry powder. Toss veggies with olive oil and spices. Line a cookie sheet with foil and arrange veggies in single layer. Roast 30 minutes, turn them over and roast another 20-30 minutes. Enjoy hot or room temp. Have a magical day, my friends! In that life-changing moment when I first read on the National Park Service’s website that a raindrop falling into the headwaters of the Mississippi River in northern Minnesota would travel the river for 90 days to reach the Gulf of Mexico, I felt a paradigm shift. Since then, seeing the great River in that way has changed my life in ways I could never have imagined. There came the incredible opportunity to travel for 90 days, keeping pace with an imaginary raindrop called Serendipity, seeing our home and our history from that new perspective and sharing it all with thousands of truly amazing people. Now, there is the adventure of bringing it together into a book that will give others this glorious experience. Every day, I am filled with gratitude for the opportunity to participate in this project. One of the perspectives that I treasure from this participation is seeing ever more clearly the oneness of life. It is one river, one ever-circulating system of water around one planet populated by variations of one Life Force. We know how travel always seems to have this effect to some degree – it lifts us out of our “me and mine” perspective and into something greater. This morning, my husband passed along a link to a video that includes some of the voices of the few among us who have journeyed much farther – and I was so moved by it, that I want to share it with you. When astronauts return from space, having seen the earth as one indescribably beautiful and delicate ball in an incomprehensibly vast network of interconnected galaxies, that greater perspective becomes their new framework for viewing life. Most of us won’t be able to duplicate their actual experience, but because they are willing to try to describe what is actually beyond the scope of words, we might be able to sense what cannot be spoken. So, here’s the link. I invite you to give yourself a little gift – it costs only 18 minutes of your day and the perspective it offers is, I think, priceless. Gayle Harper on They’re Here!!! terry larson on They’re Here!!! Melpo Troumbi on They’re Here!!! Mary Sue Chatfield,… on They’re Here!!! Stephen Marshall on They’re Here!! !